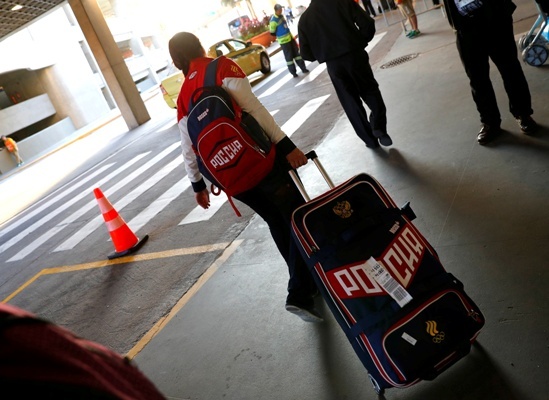 IMAGE: An unidentified member of Russia's Olympic team carries her belongings outside the airport in Rio de Janeiro. Photograph: Kai Pfaffenbach/Reuters. The International Olympic Committee (IOC) will not impose a blanket ban on Russia for next month's Rio Olympics over the nation's doping record but will leave decisions on individual athletes' participation with their sports federations, it said on Sunday. The IOC's announcement follows the World Anti-Doping Agency's (WADA) call for a Rio ban in response to the independent McLaren report that found evidence of widespread state-sponsored doping by Russian athletes at the 2014 Winter Olympics in Sochi. The world governing body's ruling 15-member executive board met on Sunday via teleconference -- with the Rio Games' Aug. 5 opening ceremony less than two weeks away -- and decided that responsibility for ruling on the eligibility of Russians remains with the international federations. The IOC had said that disciplinary proceedings would be opened against Russian officials mentioned in the World Anti-Doping Agency's (WADA) McLaren report on Monday. The report produced by Canadian law professor Richard McLaren described extensive doping and cover-ups across a series of summer and winter Olympic sports and particularly at the Sochi Winter Olympics hosted by Russia in 2014. The IOC said this week that it would not organise or give patronage to any sports event in Russia, including the planned 2019 European Games, and that no member of the Russian Sports Ministry implicated in the report would be accredited for Rio. It had also ordered the immediate re-testing of all Russian athletes from the Sochi Olympics, as well as a full inquiry into the alleged doping cover-ups, instructing all international winter sports federations to halt preparations for major events in Russia. Since then a series of international sports federations, anti-doping agencies and athletes have called for a blanket ban of all sports at Rio, though some have said they are against punishing innocent athletes. Russian President Vladimir Putin had warned that the affair could split the Olympic movement, bringing echoes of the 1980s when the United States led a political boycott of the Moscow Games of 1980 and the Soviet Union led an Eastern Bloc boycott of the Los Angeles Games four years later.